Everyone around the world knows Detroit as the Motor City, and we’re darn proud of it, but I’ll bet you didn’t know that our coffee heritage is second to none! 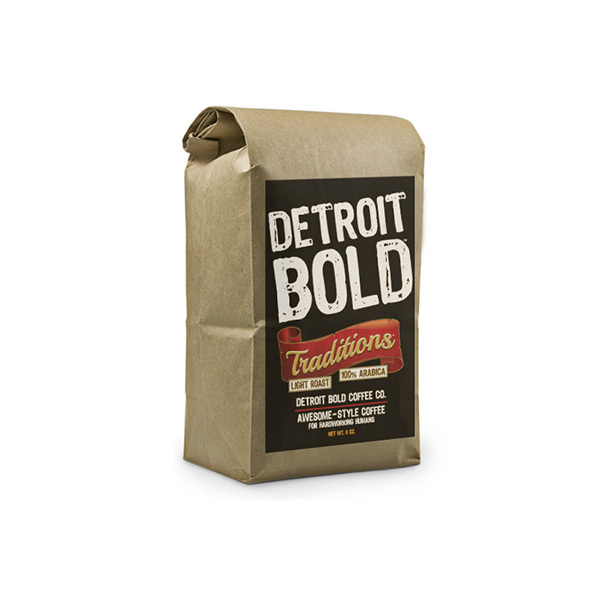 Detroit Bold Traditions harkens back to the days when Model T’s were humming off the line and coffee, the original energy drink, was being roasted just a few blocks away! Enjoy our supremely flavorful 100% Arabica Light Roast coffee, just as it has been for generations. I love this coffee. Picked up the Detroit Bold Traditions at my local grocer in the Ann Arbor area. I am not a “coffee person,” and though I drink it every day, I really don’t like the taste of coffee alone. So, I usually fluff it up with whatever sweet coffee-taste-removing concoction I can muster. Even then, most coffee flavor comes through, bitter like a cup of despair. This stuff, however, I love. It’s so smooth and wonderful. I’m not saying I don’t still fluff, but it’s significantly dumbed down. It’s all I drink now, thank dog I can find it at several of my local grocery empires. Wakes me up like nothing else. Has become my favorite coffee. My grocer was out of the blue bag Bold but they had the Traditions so I got it. This is the best coffee I have ever tasted and that includes the Kona I had in Hawaii and the Blue Mountain I had in Jamaica. It is the only coffee I can drink black. It’s not bitter, it’s quiet and doesn’t boast it’s strength, but my cup in the mornings gets me right and ready for my days. This coffee is the bomb.com! Love it – it’s our go to coffee ! Every cup is exactly right – perfect !